Arsenal players arrived in Manchester on the eve of their clash with Manchester United as they attempt to give their manager a memorable send-off. It will be the final time Arsene Wenger leads the Gunners out at Old Trafford and he will be hoping his last game there can produce a positive result. Arsenal will also have one eye on their return leg against Atletico Madrid next week. With little to play for in the league, the early signs are some key players will be rested. 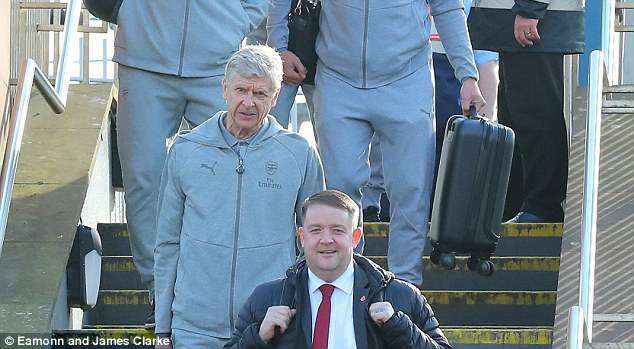 The Gunners travelled by train from London ahead of Sunday’s match and all the players and staff wore grey Arsenal tracksuits as they headed to their hotel. A number of regular first-team players have made the journey north despite next week’s season-defining game with Atletico. Granit Xhaka, Hector Bellerin and Danny Welbeck were among the regular first-team players photographed arriving in Manchester on the eve of the match. Pierre-Emerick Aubameyang looks set to start due to his Europa League ineligibility and there is also a surprise return to the squad in the form of Henrikh Mkhitaryan as he returns to his former club. However, there appeared to be some noticeable absences, with midfield stars Mesut Ozil, Jack Wilshere and Aaron Ramsey not present. Jose Mourinho was also busy on Saturday evening as he arrived back at The Lowry Hotel to make his final preparations before the match. It could be the last time Mourinho faces Wenger with the Arsenal boss set to step down at the end of the season and his future unknown. Earlier this week Mourinho moved to put their history of negative incidents behind them. When asked if he regretted the times they clashed, Mourinho said: ‘Yes I do and probably he also does. Manchester United host Arsenal on Sunday afternoon.